GENEVA, Switzerland, March 25, 2014 (ENS) – Breathing polluted air claimed the lives of some seven million people in 2012, the World Health Organization reports in new estimates released today, confirming that air pollution is now the world’s largest single environmental health risk. This figure amounts to one in eight of deaths globally and more than doubles previous estimates, WHO said, emphasizing that cutting air pollution could save millions of lives every year. “Cleaning up the air we breathe prevents noncommunicable diseases as well as reduces disease risks among women and vulnerable groups, including children and the elderly,” said Dr. Flavia Bustreo, WHO assistant director-general for family, women and children’s health. “Poor women and children pay a heavy price from indoor air pollution since they spend more time at home breathing in smoke and soot from leaky coal and wood cook stoves,” said Dr. Bustreo. The new data reveal stronger links between both indoor and outdoor air pollution exposure and cardiovascular diseases, such as strokes and ischaemic heart disease, as well as between air pollution and cancer. These links are in addition to air pollution’s role in the development of respiratory diseases, including acute respiratory infections and chronic obstructive pulmonary diseases. 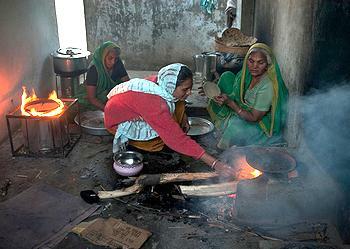 After analyzing the risk factors and taking into account revisions in methodology, WHO estimates indoor air pollution was linked to 4.3 million deaths in 2012 in households cooking over coal, wood and biomass stoves. 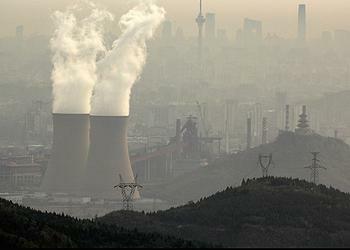 This new estimate is explained by better information about pollution exposures among the estimated 2.9 billion people around the world living in homes using wood, coal or dung as their primary cooking fuel, as well as evidence about air pollution’s role in the development of cardiovascular and respiratory diseases, and cancers. Many people are exposed to both indoor and outdoor air pollution. Due to this overlap, mortality attributed to the two sources cannot simply be added together, hence the total estimate of around seven million deaths in 2012. “Excessive air pollution is often a by-product of unsustainable policies in sectors such as transport, energy, waste management and industry. In most cases, healthier strategies will also be more economical in the long term due to health-care cost savings as well as climate gains,” said Dr. Carlos Dora, WHO coordinator for public health, environmental and social determinants of health. “WHO and health sectors have a unique role in translating scientific evidence on air pollution into policies that can deliver impact and improvements that will save lives,” he said. 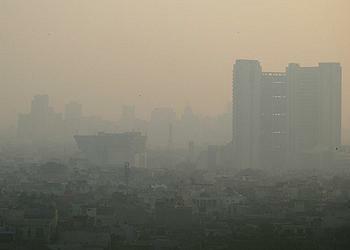 Delhi has surpassed Beijing as the world’s most polluted city. According to India’s Center for Science and Environment, the Indian city of 17 million averaged 575 micrograms per cubic meter of the airborne pollutant , fine particulate matter, PM2.5, in November and December of last year. WHO’s new estimates are based not only on more knowledge about the diseases caused by air pollution, but also upon better assessment of human exposure to air pollutants through the use of improved measurements and technology. Scientists can now make more detailed analyses of health risks from a wider demographic spread that now includes rural as well as urban populations. Regionally, low-income and middle-income countries in the WHO South-East Asia and Western Pacific regions had the highest air pollution-related burden in 2012. In these regions, a total of 3.3 million deaths were linked to indoor air pollution and 2.6 million deaths were blamed on outdoor air pollution. Included in the assessment is a breakdown of deaths attributed to specific diseases, showing that the vast majority of air pollution deaths are due to cardiovascular diseases. Among the deaths caused by outdoor air pollution, 40 percent were victims of ischaemic heart disease, characterized by reduced blood supply to the heart. It is the most common cause of death in most western countries. Forty percent of the deaths attributed to outdoor air pollution were stroke victims. Eleven percent died of chronic obstructive pulmonary disease, COPD, six percent died of lung cancer, and three percent of these deaths were caused by acute lower respiratory infections in children. Of the deaths attributed to indoor air pollution, 34 percent were stroke victims, 26 percent died of ischaemic heart disease, 22 percent died of COPD; 12 percent were children who died of acute lower respiratory infections and six percent died of lung cancer. The new estimates are based on the latest WHO mortality data from 2012 as well as evidence of health risks from air pollution exposures. Estimates of people’s exposure to outdoor air pollution in different parts of the world were formulated through a new global data mapping. This incorporated satellite data, ground-level monitoring measurements and data on pollution emissions from key sources, as well as modeling of how pollution drifts in the air. “The risks from air pollution are now far greater than previously thought or understood, particularly for heart disease and strokes,” says Dr. Maria Neira, director of WHO’s Department for Public Health, Environmental and Social Determinants of Health. “Few risks have a greater impact on global health today than air pollution; the evidence signals the need for concerted action to clean up the air we all breathe,” said Dr. Neira. The release of today’s data is a step in advancing a WHO roadmap for preventing diseases related to air pollution. This involves the development of a WHO-hosted global platform on air quality and health to generate better data on air pollution-related diseases and strengthened support to countries and cities through guidance, information and evidence about health gains from key interventions.